Every month we are featuring one pet on our Facebook cover photo and website. August’s Pet of the Month is Wookie! 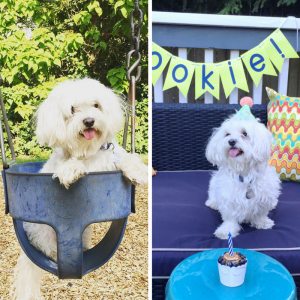 Wookie is a 7-year-old Maltese who was adopted by his forever family in November of last year. He just turned 7 last week and his family threw a birthday pawty for him. He can often be found eating lettuce, running around the house with socks in his mouth, or making his signature “donut” with his blankie before bed. He’s been a welcome addition to their family. Wookie is also the shopdog for his owner’s Etsy shop, Woot and Wooks. They make beautiful greeting cards and party decor for weddings, bridal showers, baby showers, and other occasions. Check out their shop! Follow them on Facebook and Instagram too!